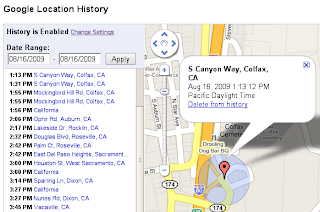 Location history is going to be *so* useful... thank you! If only Latitude were available for WebOS I would be using it everyday. This looks like such a great tool. Would love this on Web OS! other wise awesome stuff, but we need more people! WebOS, yes, please! I've been wanting location history so badly, I've been thinking about hacking together my own lame, scripted solution on the linux side of the phone. I loved this on my Blackberry, but now it's time for some WebOS lovin! Port it into J2ME maps, please. Thanks for new stuff in Latitude! Can you make the latitude igoogle app available in Portugal? Great feature. I hope its also available as Android app or better, integrated in Maps on phone as feature. Would be better than Google's MyTracks. Still useless on the iPhone without a native app with background updating. Out of all my iPhone-owning Latitude users a grand total of zero have updated their location in the last month due to the manual nature of it on the iPhone at this point. i'd like to join in the requests for a webOS version...thanks in advance! How to enable and view the history for a google app account? I bundled my google app account on my Android 1.5 phone so I can only use google latitude on my google app account. I don't know how to put this in a better way, so I will scream it from the top of my lungs in the front of Rockefeller Center in NYC if I have to! Thanks in advance guys... I know that some of you out there in CA carry either the Pre or the Pixi. Do us a favour and get us Latitude also. New Picasa feature? Geotag photos from Latitude History? I'd love it. If only we could have the BB app always use GPS and not fall back on triangulation when the app isn't open - it's really inaccurate in rural areas without cell tower density, and I bet that could get annoying with alerts. Sounds interesting. Is there a WebOS version of Latitude in the works? That sure would be swell. I'd love to use this on my Moto Droid, but the 'Download from Market' button on the page you sent to my phone doesn't work. The learning thing in the usage of the history seems a good idea (at work, home...). But can I teach it to ignore errors in the positioning? For example, for the last night the history shows that I've been "sleepwalking" in the neighbourhood :). Then again, I haven't used this service long enough to know if errors in the positioning process really matter :). Very nice but for some reason I can not use the history and alert feature with my Google Apps account? I use my gmail account on my laptop and my phone uses my Google Apps account. Please make it work with Google Apps. I too would love to see this on webos. Please stop ignoring a great platform. Another vote for WebOS support, thanks! What about ANDROID? Why does Google not support its own platform more? Thank you so much for adding the history feature! Also, it would be great if there was a way to save a Google Latitude history location to one of "My Maps" in google maps. That way if I found a great place and look it up in my Google Latitude history I could then put it on a map to share, thanks! Thats weird.. I think latitude is there in android.. it's in the native Google Maps application.. Click on menu button and there is an option to join Google Latitude.. This feature would be much more useful if Google Maps would allow us the option to update our location at a selected interval (like the bLADE app for FireEagle). Is this in the plans? question: how often does it update? i use an app that kills tasks if they're idle. will this interfere with it?